The AduHid Dynamic Link Library (DLL) allows programs to communicate with Ontrak ADU devices. 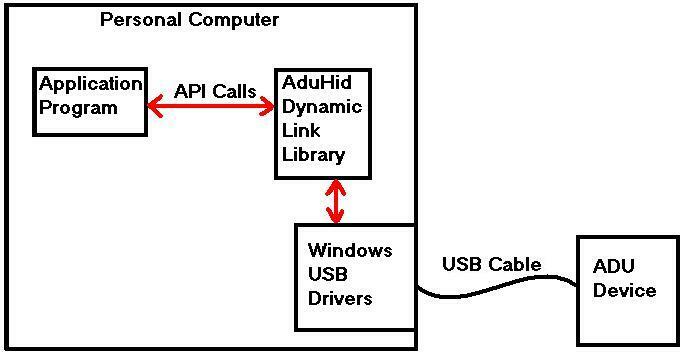 This document describes the Application Programming Interface (API) that the AduHid.dll provides. Experienced programmers can read the Overview and then jump to the Quick-Start page for their environment. Beginners can read the Overview and then follow the click-by-click instructions to build a simple application. Advanced Topics include timeout processing and using multiple ADU devices on one computer. The AduHid allows a program to communicate with an ADU device through a pipe. Three types of pipes are provided. These links are for programmers conversant with building applications.